Considering the build quality, this amp is good value for money - it's built to last, with lots of old-school valve knowledge, from one of the world's top boutique names. A compact, portable valve combo that blends old-school build quality with a rocking drive sound. Like many boutique amps, it's not particularly versatile. Denis Cornell is one of the most experienced and well-respected names in guitar amplification, with a career that stretches back around four decades to the golden years of British amplification, when he worked at Sound City, and later Vox alongside the legendary Tom Jennings. For the last 20 years or so, Denis has been building his own range of hand-wired heads and combos, attracting an elite clientele that includes Andy Fairweather Low, Eric Clapton, Wilko Johnson and Robin Trower, to name but a few. Cornell's Vintage Brown 10 is a new design and the first in a new three-amp range, intended to recreate the heady overdriven rock sounds of the 1980s. 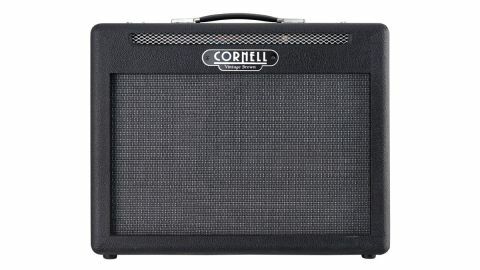 Like all Cornell amps, the Vintage Brown is built to exceptionally high standards, featuring a ply cabinet that's perfectly covered in black vinyl, with silver metal vent grilles and a grey speaker cloth complementing the Art Deco-inspired logo, which, like the control panel, is engraved Traffolyte for old-school appeal. The hand-wired electronics live inside a chrome steel welded-corner chassis, with most of the small components sat on a custom-made board that uses a mixture of turrets and eyelets. Valve bases, pots and rear-panel sockets are all the best parts that money can buy and hand-wired to a standard that's on a par with the best we've seen, with groups of wires carefully tied together, while AC conductors are twisted and pushed into chassis corners to reduce hum. "This amp is typical Cornell: exceptional build-quality and vintage design cues combine to produce an amp that will stand up to any use and abuse." The finished board is sprayed with a conformal coating that protects everything against moisture and oxidisation, ensuring that solder joints will be just as shiny in 20 years' time as they are now. The Vintage Brown 10 is a deceptively simple single-channel design, with a defeatable gain control, three-band EQ, master volume and spring reverb. There's also an EQ shift switch and a four-position output switch that progressively turns the amp down from 10 watts to an eighth of a watt. Lurking behind the grey speaker grille is a single 12-inch Celestion V-Type loudspeaker, a driver that's becoming very popular with amp builders as it does a fair job of reproducing the woody thump of the old G12s used back in the late 1960s, but with a more detailed treble response. Overall, the Vintage Brown 10 is typical Cornell: exceptional build-quality and vintage design cues combine to produce an amp that will last forever and stand up to any amount of use and abuse in the most demanding live and studio environments. Despite its retro looks, the Vintage Brown is a medium- to high-gain monster that sounds great with single coils, but really comes alive when teamed with a beefy humbucker. Backed off and played nearly clean, there are hints of Dumble in the rich, detailed midrange and treble, accentuated by the valve-driven reverb circuit. However, when wound up, it's somewhat more aggressive, with a toothy bite that needs a little taming on the tone controls. The EQ shift switch is handy for accentuating the midrange for a little more punch, or removing it as required. We tried the Vintage Brown with a variety of instruments including a Fender Custom Shop 60s Strat and an old PAF-loadedLes Paul Standard. The Vintage Brown's belligerent treble means some single coils could be a little too sharp, but we found the perfect balance with the Les Paul, with a fiery vocal sustain that easily cut through a live band - great for lead or crunch rhythm, typical of hot-rodded JCM800s, but without the nasal honk. There are two ways to use the Vintage Brown. You can either balance gain and master volume to taste, or use the defeat switch to remove the gain control from the circuit. With no preamp gain, the guitar's volume control easily cleans up the overdrive, using the output power switch to balance levels for the best results.